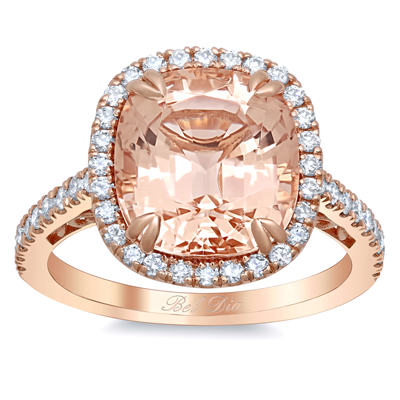 We love morganite engagement rings because of their beauty and hue. 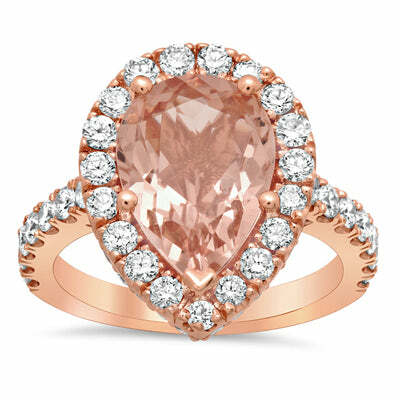 Morganite has a peachy pink color, which is enhanced when set into rose gold. Our morganite engagement rings come in a variety of stone shapes, sizes, and designs. We have loved creating an array of different engagement ring looks that complement the uniqueness of this romantic gemstone. We wanted to share a few of our favorite designs to help you with your own morganite engagement ring inspiration. If we do not have exactly what you are looking for, contact a deBebians jewelry expert or fill out our custom jewelry request form. We would love to assist you! 1. Morganite Rose Gold Halo Engagement Ring with Floral Basket This morganite engagement ring is one of our most popular designs because of the diamond halo as well as the decorative basket. The basket is shown in the side profile of the ring and feature decorative flourishes of precious metal. The morganite center stone is a cushion cut and is available in 2.50 carats or 5.25 carats. 2. Morganite Pear Pave Halo Engagement Ring This pear engagement ring also features a distinctive side profile. It features an array of accent diamonds, both down the side of the diamond halo as well as on the bridge of the ring. The pear shaped center stone is an incredibly flattering shape and is available in 2.50 carats. We use AAA quality morganite and G color VS clarity diamonds. 3. 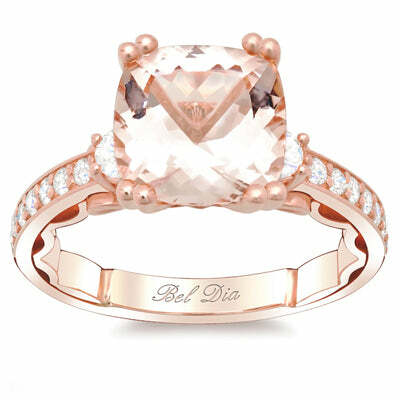 Morganite Three Stone Engagement Ring Last but certainly not least is our three stone morganite ring. This ring features a ribbon-inspired band. This ring is one of our most popular designs. We offer the cushion cut center stone in both 1.25 carats and 2.50 carats. The ring features two larger side diamonds as well as pave set diamonds down the band. Which style of morganite engagement ring is your favorite? Comment below and we will do our best to highlight it soon!